Kotak Mahindra Bank debuted a new campaign last week, right after budget and in time for the most significant month in the Indian Financial Year. The new campaign is an extension of the popular ‘Subbu sab janta hai’ commercials that presented Vinay Pathak as the endearing Mr. Know-it-all, Subbu. He is back with his elvish charm, in the new commercial ‘Life Mein Khushi ka Khata Khol Le’ with a new breezy jingle urging everyone to open an account with KMB for apparent interest rate benefits. Last week KMB took over Yahoo! 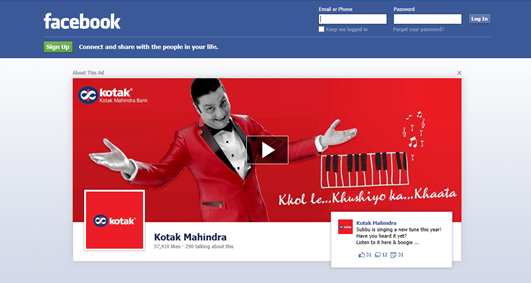 India’s Email Login Page and Facebook Logout to promote the new commercial. The clean video renditions stood out. In addition to frequent updates and deconstructing the TV commercial on its Facebook Brand Page KMB also used Promoted Tweets to drive users to its Dining Deals page.